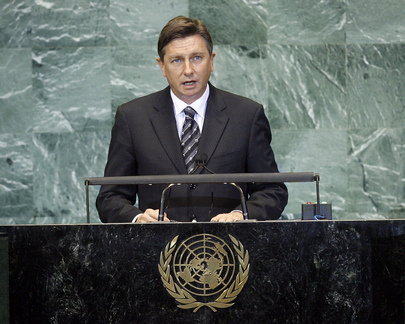 BORUT PAHOR, Prime Minister of Slovenia, said that, while the United Nations needed to keep its place at the core of global governance structures, the Organization also needed to adapt to the realities of today’s interconnected world and the resultant new challenges and threats. In that regard, the world body’s reform was long overdue - the composition of its Security Council was visibly out of date and the work of the General Assembly needed revitalization. He told the Assembly that progress in reform of peacekeeping would strengthen all other United Nations activities relating to the maintenance of international peace and security, including preventive diplomacy and post-conflict peacebuilding. The reforms of international economic and financial systems needed to continue at an accelerated pace, to reflect global development needs. He said the international community’s efforts to that end needed to aim at increasing accountability, responsibility and solidarity, while taking into account the need for a stronger voice and better participation of developing countries, which must be fully included in the international response to the crisis. He regretted that, as a result of far-reaching developments, the international community continued to face an even greater challenge in climate change, observing that the past year had been a year of lost opportunities. Stressing that climate change was real, he urged the international community not to lower its ambitions or lose its resolve to address the consequences of that phenomenon, pointing out that the loss of biodiversity was unprecedented, and the consequences were already being felt by far too many people around the world. Continuing, he said that it was unfortunate that the ongoing internal debates about the financial and economic crisis in many European States had pushed aside discussion of some other topics that were important, natural and of strategic interest to the continent as a whole. The need for a continued process of enlargement of the European Union and the North Atlantic Treaty Organization (NATO) was one of them. He underscored the importance of honouring the commitment to expansion to the Western Balkans, particularly since the situation in the region had changed for the better.